Since the 1950’s onwards, Mancunians have had a passion for creating and following great music. Be it live or via recordings, the city has been a magnet for generations of locals – and in recent years music fans from all over the country and beyond – to enjoy. Whilst cities such as Liverpool and Memphis turned their musical heritage into tourist attractions, Manchester kept looking forward, developing new scenes and tastes. Yet the 2002 film ‘Twenty-Four Hour Party People’ was probably the point at which Manchester music fans started to look back at the rich musical history of their city. 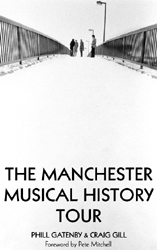 This coincided with the publication of ‘Morrissey’s Manchester’ by Phill Gatenby and numerous other publications penned by luminaries of the Manchester scene. 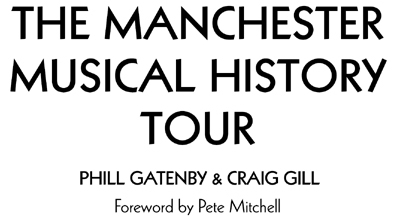 Following the success of this guide book dedicated to locations associated with The Smiths, authors Phill Gatenby and Craig Gill put together several tours featuring other world famous Manchester bands from Buzzcocks via Joy Division to Oasis and Doves as well as the various scenes from Beat to Acid House and even Lo-Fi. An interesting guide for anyone with an interest in British music, this guide documents the various clubs and venues that have influenced Manchester based musicians over the last 50 years. Phill Gatenby - first began writing for the Manchester City fanzine ‘Blue Print’ in 1988 and then his own City fanzine ‘This Charming Fan’ in 1993. After contributing to various other books and magazines, he wrote Morrissey’s Manchester – the guide to the city’s Smiths & Morrissey landmarks in 2002 - and a London edition, Panic On The Streets, in 2007. In 2008 he ghost wrote Sully and the follow up in 2010, Sully – Grafting For England. Craig Gill - is a musician and DJ. Inspired by other great Manchester acts, Craig joined local band Inspiral Carpets in 1985 aged fourteen and over the next ten years he travelled the world, notching up twelve Top 40 singles and four Top 10 albums. A passion for record collecting later came to fruition in the mid nineties, when the Hacienda and Boardwalk nightclubs were amongst many to offer Craig DJ residencies at their clubs, long before the celebrity DJ phenomena was born. Through playing in bands and DJing he has built up strong and lasting friendships with lots of other Manchester musicians, managers and promoters, whose inside knowledge and stories have been invaluable in helping him track down locations and sites to create music tours and its book companion.